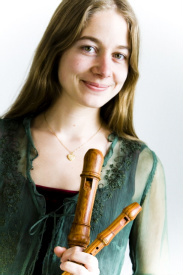 Heidi Rohlin Westin is a recorder and traverso player and a teacher in recorder and ensemble. She got her degree from Royal College of Music in Stockholm, Sweden, in January 2010. Her teachers have been Dan Laurin, Claudia Müller and Björg Ollén. Heidi has received scholarships from the swedish Royal Academy of Music, Royal College of Music and Sandrews stiftelse. Today she works in Stockholm as a musician and recorder teacher. In Sundbyberg she has her own music school for recorderplayers, ensemble and baby rythmic. The autumn 2010 Heidi did a research about recorderplaying and contemporary music in Sendai, Japan. If you are interested in private lessons, upcoming concerts, or have any other questions, please send an e-mail at the page "kontakt".